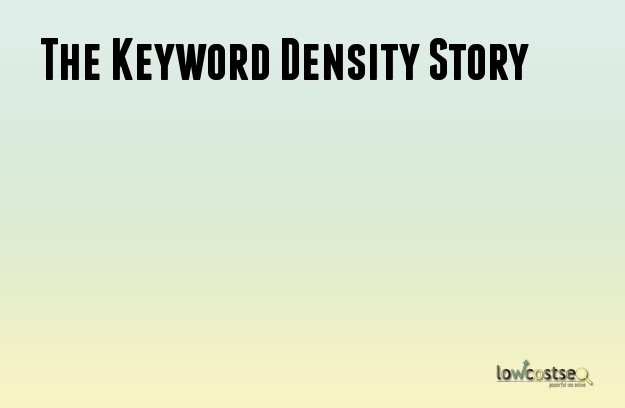 I have actually lost count how many times people have asked me, what exactly is Keyword Density? Well this is a term used in reference to the amount of times the keyword appears in the text or web page. There are also debates on what is the best keyword density percentage for an article or web page? What we believe is that when writing any sort of blog, article or text, ignore the keyword density to begin with and focus solely on the aim of writing quality content with aim of it being engaging, informative and unique. Keyword density as mentioned above is the times a keyword or phrase is located on your page content. Now lets see how to calculate keyword density. Take a web page for example that has 100 words. Now in there you have your keyword or keyword phrase added around 5 times, therefore the keyword density is 5%. Here is the formula - No of time keywords repeated / total number of words x (multiply) 100 = Keyword Density. What many people do is create content with high keyword density and then place it on their web page. Now they forget on actually reading the content and making it if it makes sense or not? In this day and age, you simply cannot fool Google into believing the content you have is engaging and not written for just the search engines only. Avoid that at once! No one can tell you what the exact percentage is for Keyword density as no search engine would tell you that. Rule of the thumb is strive to get it below 5% always. If the Keyword density is very high then search engines will see this as if you're trying to spam them and if it is too low then search engines will not know what message you're trying to convey to them. Just don't let the issue of Keyword density rule or control your way of writing. Do not worry if the page has low keyword density but yet the content is clear, informative and engaging. Readers want articles that provide them with information on what they are searching for. How much is too much in terms of Keyword Density? Firstly decide on the topic you are going to write about, then think of the keyword or keyword phrase. Once all chosen then attempt to begin using it in your write-up. As an advise to you, if you do not have lots of text on the web page then by repeating the keywords you might end up making the keyword density too high. Check carefully in this process. As mentioned earlier, your first objective should be getting your message across in your content and not focusing on Keyword density. Your customers should be the ones who you should be writing for and not the search engines. Try proof reading the content or have your friend or colleague read the article to point out any mistakes whatsoever? The better the article content and quality, the more likelier it will be for the customers to comeback and read more articles of yours. We at Lowcostseo, never count the keywords at all. We just want to make our work engaging and pass on useful information to the end user that is you. We know that when a client comes to our site, he/she is looking for answers so we have to answer those in the articles rather then focus on keyword density. If you need more help in understanding Keyword Density then feel free to contact us!